As reported in The Hollywood Reporter, DC Films and Warner Bros. are developing a spin-off from Aquaman. I’m sure we’ll eventually get a straight-up Aquaman 2, but for the moment writers Noah Gardner and Aidan Fitzgerald have been hired to pen a horror movie based upon the Trench. 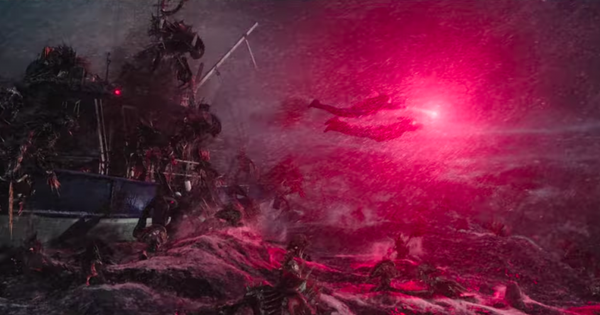 Yes, those monsters from the third-act of Aquaman are getting their own movie, one produced by James Wan and Peter Safran and intended to be a lot cheaper than a conventional DC Films movie. The entire Conjuring Universe, which has earned $1.569 billion worldwide over five movies on a combined budget of around $100 million, is partially motivated by this kind of thinking. You liked that creepy doll from the opening scenes of The Conjuirng? Well, now you’ve got a whole movie, Annabelle, about that scary doll! You soiled your britches in fear when that scary nun turned up in The Conjuring 2? Well, then you’ll love The Nun! Oh, and you’re getting a Crooked Man movie too! We can debate the quality of these movies (Annabelle: Creation is by far the best of the spin-offs), but it’s a model that has yielded riches to all involved. And with Warner Bros. swearing that the post-Justice League DC Comics movies will be less interconnected and less beholden to grand narrative designs, this kind of one-off horror spin-off makes at least some sense. Like The Nun, I imagine it’ll be a self-contained horror flick that just happens to be set in a larger universe. James Wan noted on Twitter that (without officially confirming the project’s existence) that he fell in love with the Trench and its designs during Aquaman preproduction and had secretly hoped to explore it further. So you can argue that this project is a kind of “one for me” after the $1.1 billion-plus success of Aquaman. Moreover, this is the first move from DC Films that absolutely feels like something from the gang who turned The Conjuring into the first successful post-Avengers cinematic universe. As always, any reporting about “in-development” DC Films flicks should be taken with a grain of salt, as just because one is being developed doesn’t mean it’s going to get made. However, since the Annabelle doll actually cameos in Aquaman, I guess we can speculate as to whether, Patrick Wilson doubles notwithstanding, the events of the Conjuring movies exist within the world of DC Films.